Sandy beaches that stretch for as far as the eye can see, sparkling azure waters, beautiful countryside, pretty villages, historic towns, dynamic cities and a genial atmosphere; come and discover why the Costa Dorada is the number one luxury camping destination of Spanish families looking for that something special. Why choose a luxury camping site on the Costa Dorada? The Costa Dorada, or Daurada in Catalan, is located in the province of Tarragona, Catalonia. 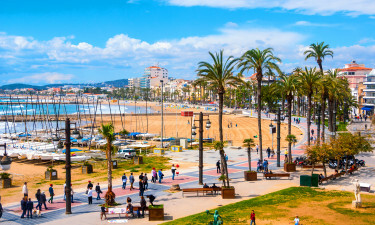 Famous for its 100 miles of golden coastline, it is also home to pretty villages, Gothic cathedrals, medieval monasteries, Roman remains, nature parks and the vineyards of the Penedès region. Not many campsites can boast a Roman-style amphitheatre amongst its many attractions. A superb pool complex with excellent features for young children, a wealth of sports opportunities both on-site and off at the Blue Flag beaches of Salou, make Camping Sanguli perfect for a family camping holiday. 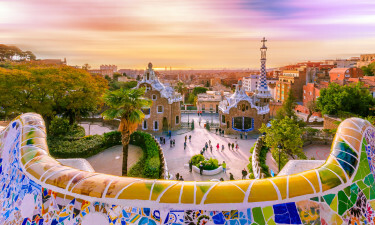 With a choice of 5 sandy beaches and the vibrant cities of Barcelona and Tarragona a bus ride away, this is the ideal spot for combining a luxury camping holiday with a city break. Surrounded by greenery, this spacious park has 2 enormous pool complexes, and tons of activities and entertainment to offer. A beachside park nestled beside the magnificent Tamarit Castle, this is a location the whole family will adore. Water sport and nature lovers are particularly well served here. Dining on the beach terrace under the soft glow of the floodlit castle is a magical experience. The Costa Dorada has 38 beaches with Blue Flag status. Altafulla, Calafell, Cambrils and the quiet charms of Cunit are ideal family destinations. The 5 Blue Flag beaches of L’Ametlla de Mar are simply beautiful. Mont-roig del Camp_Miami-Platja has 12km of sandy coastline and lovely coves. Tarragona has 4 Blue Flag beaches and Torredembarra boasts salt water lagoons. Vilanova i la Geltru has great beaches and a beautiful marina. Nature lovers can explore the beauty of the Sierra de Prades and the Parc Natural de Delta de l'Ebre. Few cities have combined the old with the new to such breathtaking effect as Barcelona. Think stunning architecture, superb museums and restaurants, chic boutiques and a vibrant bar and club scene. Due to its proximity to Barcelona, the medieval port city of Tarragona is often overlooked. A UNESCO World Heritage Site, thanks to its Roman remains, it too has many cultural attractions and a buzzing nightlife. The fashionable town of Sitges is not only a nightlife hotspot, but has many charms in daylight too! PortAventura theme Park is invariably the first destination for young children, whilst older children will appreciate Bosc Aventura Salou adventure park. Water sport lovers can choose from surfing, sailing, kayaking, diving, kitesurfing and more, with schools and clubs providing expert tuition and equipment rental. From the wild mountain ranges of Tivissa and Cardo to the wetlands of the Ebro Delta, there is no shortage of unspoilt landscape to explore on foot or mountain bike. One of the draws of any holiday is the cuisine, and the Costa Dorada is no exception. 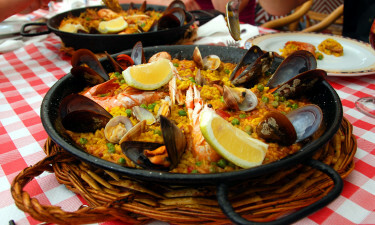 Here, you can sample amazing seafood and local specialities such as suquet, a Catalan stew and, of course, paella. Eating a lunchtime menu is an excellent opportunity to devour freshly caught grilled or salt-baked fish. Be sure to sample the world famous wines and cavas of the Penedès. Catalonia is steeped in tradition with festivals, processions and celebrations occurring monthly. The Costa Dorada benefits from a mild Mediterranean climate of glorious sunshine and clear, vivid blue skies. The north-easterly winter winds and south-easterly summer winds keep humidity at a low and also remove any fog or mist. Winter temperatures are between 7-10ºC and 20-26ºC in summer, with inland temperatures 2-4 degrees lower. Most rainfall occurs in spring and autumn, with the occasional shower in summer.